In another episode of anti-communist barbarity, the authorities of Poland removed and destroyed a memorial dedicated to the heroic Greek communist Nikos Beloyannis in the city of Wroclaw. 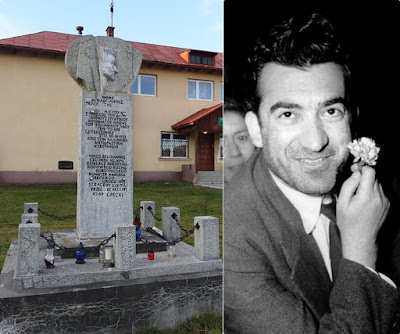 The memorial, which had been erected by Greek political refugees next to the 20th Elementary School at 143 Stabłowicka street, was removed and destroyed according to the 2016 anti-communist law which prohibits "the promotion of communism or other totalitarian regimes". It must be reminded that, a few months ago, Polish authorities had removed the plaque of a memorial dedicated to the legendary Democratic Army of Greece (1946-1949) in Dziwnów. In a statement, the Press Bureau of the CC of the Communist Party of Greece (KKE) strongly denounces this barbaric act, stressing that the removal and destruction of the memorial consists an insult to the struggles of the people. "The KKE denounces the removal and destruction, by the Polish authorities, of the memorial of the communist hero Nikos Beloyannis in the city of Wrocław in Poland. This act comes shortly after the similarly provocative removal of the plaque of the monument dedicated to the wounded fighters of the Democratic Army of Greece, which shows that the government of Poland, with the support of the EU, escalates its anti-communist attack. This is an insult to the struggles of our people, a disrespect towards the memory of the fighters of DSE, their families, the thousands of descendants who live in Greece or remain in Poland. The KKE, through its MEP Kostas Papadakis, made a telephone protest both to the Greek embassy in Poland, as well as to the Polish embassy in Athens. Also, for the same issue, MP Giannis Giokas contacted the Minister of Foreign Affairs G. Katrougalos who pledged to proceed to a relevant demarche. Big questions arise because for both anti-communist profanities against the memorials the KKE was the one that informed the Greek embassy in Poland, while the latter expressed ignorance. Anti-communism and insult against the struggles and sacrifices of our people shall not pass".